Hey Josh I great site. I picked up your book in the breakroom of the bookstore I work at about 3 weeks ago (it was an advance reader copy). I finished the book in about 2 days, it was outstanding. Being a baseball card collector during arguably one of the worst eras in the game’s history (I began collecting during the summer of the strike in 94) it was cool to read about the game during one of the best era’s, especially through the eyes of a kid. Anyway, outstanding book, I’ve been recommending it to any customer who asks me what to get. And thanks for having this site, after I finished the book I was worried I wouldn’t get to see anymore of your cool writing about old baseball cards, and life in general. It’s strange to see Frank Castillo young. 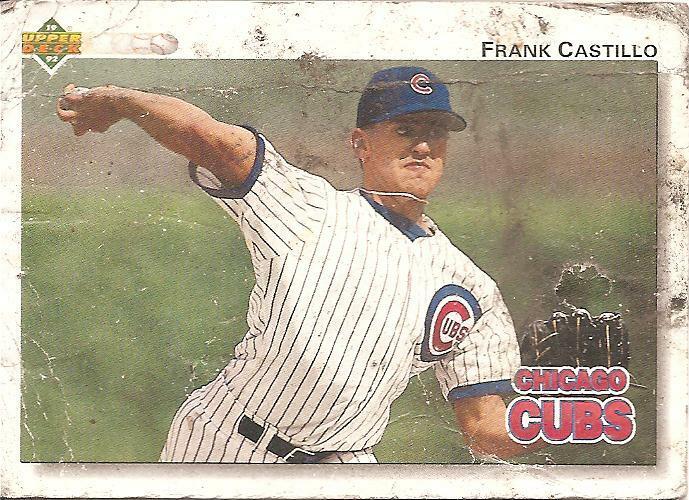 I only remember the old, grizzled and occasionally effective Frank Castillo for the Blue Jays and Red Sox in the early 2000s. Will the Cubbies finally win it all in 2011? Not bloody likely. I keep score, but have never been drunk at a ballpark. Something about paying $10 per beer keeps it away from me. A propos of nothing, I bought three packs of baseball cards yesterday. I don’t think I had bought a pack of baseball cards since 1982 or so. I gave one to my son, one to my daughter, and opened one myself. These were my childrens’ first packs of cards. The cards are very, very different now. All glossy and not feeling much like cardboard. Plus, they were outrageously expensive considering that inflation would have predicted that the 10 or 15 card packs in the 70’s would cost only 38 cents now. But… there was a lot of joy in me seeing players I knew and humbling frustration at the nobodies I got in my pack. What you say here is the way I feel much of the time. Having the words to read gives me the chance to realize this, and know that someone else feels similarly. I don’t know why this is good, but it is.